High-quality care in the earliest years of life has been shown to relate to positive developmental outcomes for children, including improved early academic skills, social-emotional competencies, and cognitive functioning. Unfortunately, the early care experiences of many children are not always high quality; rather, research suggests that high-quality care is the exception. The growing evidence relating quality care to improved learning outcomes, the variability in quality across care settings, and the failure of existing approaches to improve child care have led to a national call to enhance the quality of early care and education programs. In response to this call, states have created Quality Rating and Improvement Systems (QRISs). Philip Sirinides; John Fantuzzo; Whitney A LeBoeuf; Katie Barghaus; and Ryan Fink (2016). 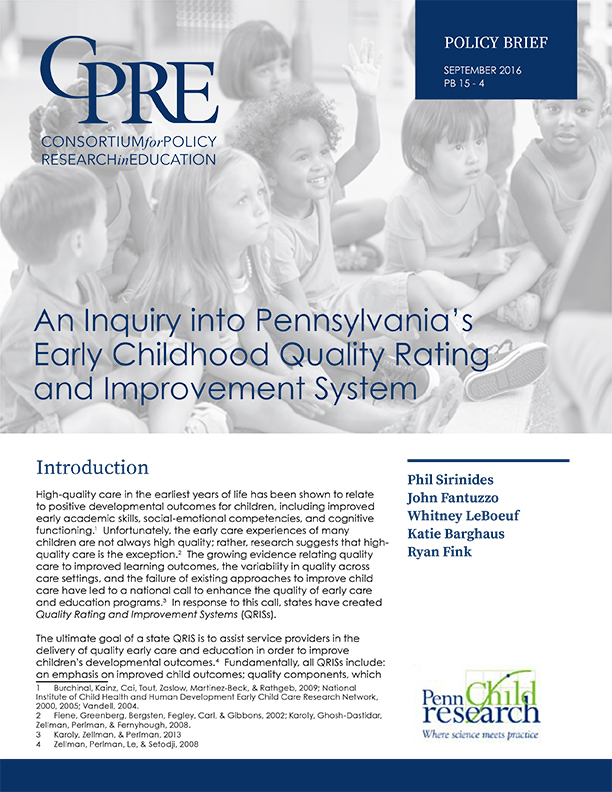 An Inquiry into Pennsylvania's Early Childhood Quality Rating and Improvement System (STARS). CPRE Policy Briefs.